The influx of investment in Africa has been well documented in recent months; for example, see a recent NextBillion post here as well as the recent cover story in The Economist. Yet despite this rapid growth, healthcare investment in Africa continues to lag well behind other sectors. Of the US$12.8 billion the World Bank spent globally on health between 1997 and 2007, only US$600 million was available for the private sector, and out of that, just US$12 million was available specifically for Sub-Saharan Africa. While those numbers do not represent healthcare investment in the private sector as a whole, it does provide context for the investment imbalance at hand. There is little private investment and/or risk capital available for most of Africa. But according to Onno Schellekens, managing director at the $50 million euro Investment Fund for Health in Africa and co-founder of the Health Insurance Fund and Medical Credit Fund, this can be changed. Recently, I had the pleasure of visiting with Schellekens, who has been heavily involved with projects and organizations investing in African healthcare, specifically within the private sector. Both his current work with the Investment Fund for Health in Africa and previous work with the PharmAccess Foundation inspires a paradigm shift away from investing solely in over-burdened public healthcare systems that have not been able to offer services for all effectively. In instances where the state does not function and the public sector cannot provide consistent public services, Schellekens says the investment scenario should pay a great deal more attention to the private sector, because that’s where many individuals already seek health services and goods. (Above: An illustration outlines cycle of healthcare non-delivery; taken from Schellekens’ University of Michigan presentation in March 2012). The model Schellekens advocates aims to create a “virtuous cycle” of increased funds for health, aligning financing and delivery of services through strategic investment in patient health insurance programs. In other words, financing the healthcare demand by managing patients’ ability to pay, as well as to ensure supply by providing credit to service providers and investment in health service delivery groups including pharmaceuticals, health product producers and telemedicine system developers. The PharmAccess Foundation is one organization redefining the way we think about investment in healthcare within the African context. PharmAccess is a Dutch non-profit organization focused on strengthening health systems with specific emphasis on improving access to quality basic health care including treatment for HIV/AIDs. The organization’s strategies for addressing these challenges range from medical and administrative capacity building, health insurance programs, HIV/AIDs and general healthcare workplace programs as well as other wide-ranging health investments. Specifically, the PharmAccess Foundation has developed or helped to spur the development of three innovative forms of financing:. The Health Insurance Fund’s objective is to increase access to healthcare by providing health insurance and coordinated services to low-income groups in Africa. The fund started work initially in Nigeria, but the organization is looking at adding similar programs in three other African countries as a part of the six-year project plan. The concept is to use donor and investment monies to subsidize the cost of insurance premiums for low income, previously uninsured groups. As with development of insurance plans in most OECD countries, insurance plans are developed in their initial stages using voluntary participation in risk pools among groups, with a co-payment required by the beneficiary. The Health Insurance Fund is an independent foundation for which PharmAccess serves as a partner. PharmAccess initiates and develops specific schemes as well as implements insurance programs through contracted local partners. Other partners, from research institutions, carry out the operational research and ongoing impact evaluation. Local Health Maintenance Organizations (HMOs) are responsible for implementing insurance schemes at the country level, providing care through their network of quality health service providers. Insurance covers basic health care including treatment of HIV/AIDs, tuberculosis and malaria. The Medical Credit Fund (MCF) is an innovative social investment fund that provides access to credit to local, private healthcare providers including clinics, health centers, general practitioners, midwives and laboratories within sub-Saharan Africa. The focus of credit funds is reaching smaller private facilities in both rural and urban areas. Credit provided to private healthcare facilities is used to expand or improve service offerings and are paid back to the general fund overtime. It’s important to note that the MCF partners with national entities within investment countries. Credits are disbursed incrementally to service providers and are coupled with technical assistance for business administration and quality improvement from local partners. Additionally, local partners measure performance of credit recipients based on international quality standards. The IFHA helps to develop the supply-side of private sector healthcare by investing in medium and large healthcare service and delivery organizations. Additionally, the fund supports demand growth by investing in the development of health insurance providers. The IFHA and likewise, the medical credit fund, health insurance fund and the work of PharmAccess, serve an important role within healthcare investment, improving positive exchanges between investors, health service providers, payers and patients. 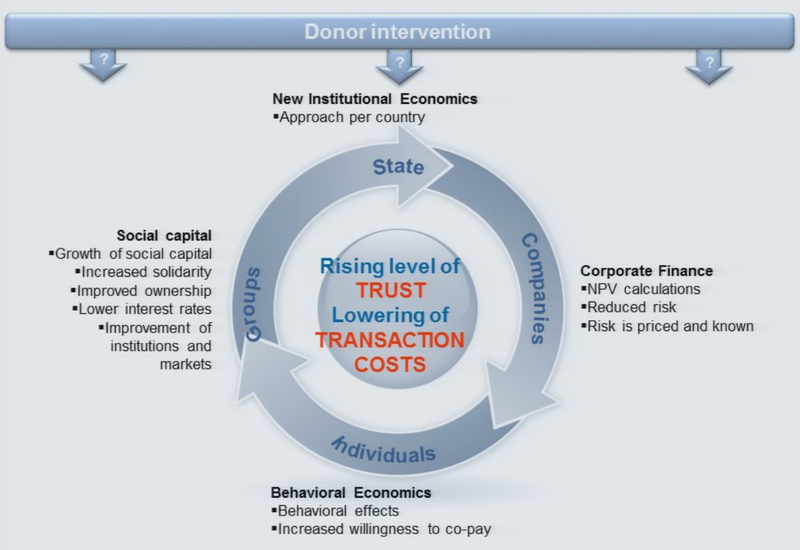 As Schellekens notes in his recent University of Michigan presentation, low-income Africans are in fact buying into a system of shared risk, when provided the opportunity. (Above: An illustration showing the model outlined by Schellekens, from his University of Michigan presentation in March 2012).